Our two pieces of pork loin, cured and rinsed. 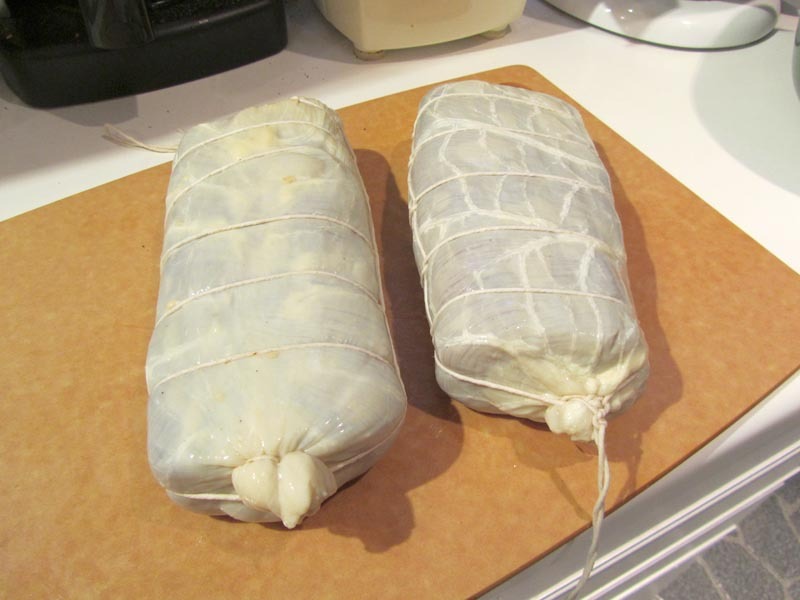 My previous post was all about curing a boneless pork loin with salt and herbs (mostly fennel seed) to make the Italian salumi delicacy known as lonzino. Now it’s time to air-dry the cured loin which intensifies the flavors and gives your creation a lovely texture somewhere between prosciutto and bresaola. If you haven’t followed our homemade guanciale project, I’ll need to tell you about the conditions for air-drying meat successfully. It’s not all that difficult. What you need is a location with a fairly steady temperature of around 55 degrees and stable humidity around 75%. Some airflow around the meat also helps in the drying process. Where do you find an appropriate place to dry around the house? It can be tough, but doable with some ingenuity. First thing that went through your mind, I’ll bet is “winter because it’s much cooler”, and you’d be right about that. Many basements have conditions similar to that – if you’ll let them. Our basement is basically unfinished and we don’t use it for much other than storage and laundry, so it was a simple matter to close off all the heating ducts down there to cause the temperature to drop a bit more. Over two winters of curing, the temperature has not dropped below 50 and stayed below 60 until early April. So we have that requirement covered. The first thing you need to be able to do is reliably measure temperature and humidity on a daily basis. If you’re in Canada, Canadian Tire sells an indoor digital thermometer/hygrometer (temperature/humidity reader ) for only $19.99 (product #42-9931-0). We have a copper analog one from Lee Valley Tools (leevalley.com, product #KD245) that mounts on a wall or a stand. So you don’t have to break the bank on this. The secret with drying meat is to have it proceed slowly and evenly. If the humidity is too low, it dries too quickly and unevenly, simply becoming too hard. With guanciale, that isn’t as much of a issue, because most of a hog jowl is fat. Lonzino is nearly all meat, so low humidity is a problem. This is also the reason for using some sort of casing on the outside (more on this later). You don’t want the outside to dry before the inside has a chance. For us (and probably for you), a consistent humidity of 75% will probably prove trickier than temperature. Last year, for some reason, the humidity in our basement was pretty good in that regard, never falling under 70% and generally staying between 73% and 77%, in other words, perfect for air-drying. I was certainly lulled into a false sense of security by 2011-12. This year it’s been all over the place, probably because Toronto has been much colder and snowier. Humidity has been as low as 62% and never higher than 74%. What to do? There are lots of examples of people using drying boxes. Since temperature isn’t a problem, that might be the way to go when our humidity isn’t optimal. Recently though, I used a small humidifier and fan to bump things up a bit since we hang things from the ceiling rafters. A box that would concentrate the effects of humidification will be the next thing I’ll try. If for some reason your humidity readings get too high, you need to use a de-humidifier to get it down, otherwise you face an increased risk for the growth of mold. On to getting your cured lonzino ready for drying. Stuffed, tied and ready to be hung and dried. As stated above, you don’t want drying to happen too quickly because of low humidity. The traditional casing for this is called a bung. It’s the front portion of a ruminant’s stomach. Pork and beef bungs are available from butcher suppliers. For this you’ll need a beef bung since pork bungs are too narrow for a pork loin. Chances are that you’ll have to buy a few of these, but they’re dried and salted so they can be kept in the fridge for quite some time. 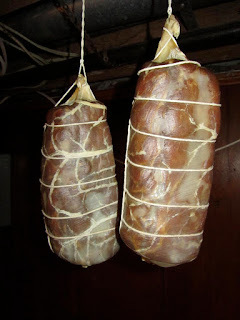 Bungs are long enough that you can encase two pieces of lonzino from one bung. Simply cut it in half. Soak the amount of casing you’ll be using for at least 1 hour in some room temperature water with a splash of white vinegar added. I generally leave it in for 3 hours so the bung is nice and pliable. Rinse the bung throughly several times with clean water. Squeeze out as much water as possible from the casing before stuffing the loin in. It you want to use artificial casing, the process will be pretty much the same. Stuff the cured loin gently into the casing. Tie off the bottom end using a bubble knot (info on this kind of knot is HERE (from Matt Wright’s excellent blog). Carefully squeeze out any air pockets between the bung and the meat. Now tie a bubble knot around the top end. When tying lonzino (or sausage) leave about a 6 inches more string at each end than is shown in the video. At the bottom of the lonzino, I tie the string around the bubble knot for little extra security – probably unnecessary if I’ve tied a proper bubble knot. At the top, you definitely want to tie both ends of the string around the bubble knot, rather than what’s done on the above video. then tie together the ends of the string so you can hang the lonzino while drying. The last thing is to prick the casing several times. This aids in more even drying. Our lonzino has finished drying! Hang the meat and check it daily to monitor how it’s doing. You might get white mold growing on it during drying (what you often see on a salami). This is no big deal. What you don’t want is green or especially black mold. If you catch these quickly, all is not lost. Carefully wipe down the lonzino with a cloth soaked in white vinegar. The cause is probably excess humidity, but it can also be caused by too much light. Our basement is pretty dark, but if your location is bright, it might be a good idea to black out a window or two. Many Italian homes in Toronto have cantinas built under the front porch. These are absolutely perfect for air-drying meat and sausages. If you have one, use it, and know that I’m very envious. Now all you have to do is wait (a tough thing for us). I weigh my lonzinos every few days to monitor the drying. When it’s lost 35% of the weight, it’s ready. Slice thinly to serve and use it any way you’d use prosciutto. We also put diced lonzino in our pasta e fagioli soup (recipe to come in a future post). As part of an antipasto plate, lonzino is fantastic. Really, this is an easy thing to make and you will be knocked out by the flavor and aroma of this little-known Italian delicacy. My wife and I have been making cured meats for a couple of years now but our experience comes from hundreds of years of family use. Our lonzino is made somewhat the same as our prosciutto's for spicing but we tend to "experiment" until we find the perfect one for our taste then set that as a main stay, not forsaking other seasonings just for variety. 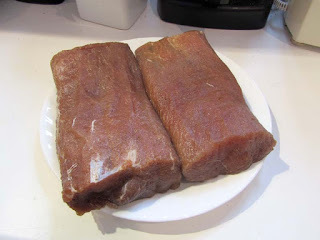 I use loin, salt, cure, garlic, and sweet vermouth in the cure for the fridge for 20 days. (ratio's given if requested.) Some recipes call for less time but for a 3.5" - 4" loin this works out best for us. During the cure time we massage the mixture every 4-5 days making sure the cure solution is touching all the meat. When we pull it on day 20 we rinse with water and pat dry then let set for a period of time to air dry. After that we rub with Extra Virgin Olive Oil before applying the seasonings for the drying time. Our favorite to date is just granulated garlic (goes on first after the EVOO. ), then black pepper (course), then crushed fennel. Quite honestly these outer coatings don't penetrate much but add a nice "rim" flavor. We don't wrap our lonzino's any more because we had some trouble with the casings maintaining a tight shrink. So all we do now in net them before we start applying the dry time seasoning. Because of the EVOO the seasoning stays on well and seems to form a cake around the meat that becomes quite durable. We also make Fennel salami's too. I would like to post some pics of the fridge drier and newer box drier that we use but I don't see a place to do that. Maybe I could e-mail you some if I could get your e-mail address. Thanks for your site. Really enjoyed it. This is the e-mail that we check daily. The g-mail address is for a blog I write on faith. Thanks for the very kind words. 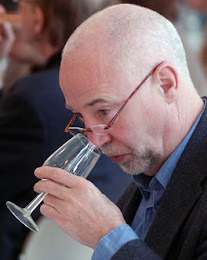 Great to meet a fellow lonzino fan, and I'd so pleased you enjoyed the site. It would be a heck of a lot easier not to have to stuff my cured meat into a beef bung in order to dry it, but we just use our basement, so the humidity is a bit tricky. I can use a humidifier to raise it, but it has to be monitored constantly to get to stay within a reasonable range. Your method of not wrapping it would probably work very well if I could do that. Maybe it's the impetus I need to build a drying cabinet. If I weren't to use the beef bung, the outside would dry too rapidly and get hard before I've lost 35% of the weight I'm shooting for -- so I use beef bungs. Your method of not wrapping it would probably work very well if I could do that. Maybe it's the impetus I need to build a drying cabinet. If I could make a suggestion, try steeping some halved garlic cloves in the olive oil you use to wipe the outside of your lonzino. Granulated garlic is pretty harsh. I've stopped using it for that reason. Great that you're doing home curing! It's fun and you know exactly what's in your salumeri -- and that's always a good thing. Oh! And try pan toasting the fennel. The flavor is more mellow and intense at the same time, if that makes any sense. Thanks for leaving the comments!